50 Years After Biafra; Still Struggling with a Growing Ideology By Femi Tunde Okunlola – Royal Times of Nigeria. 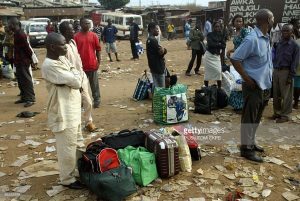 Main markets, businesses, parks and streets remained deserted on the 30th May, 2017 as residents in major cities in the south eastern parts of Nigeria stayed home in obedience to a sit at home call. The day broke and the skies cleared, but the typical bustle was missing in many parts of the Eastern parts of Nigeria. To a visitor; non conversant with happenings, it may have been rather alarming scene, however, the silence and inactivity was simply a reincarnation of a strategy used by Ghandi and Martin Luther King (Jr) years before, only in a different manner. It was a Silent Protest. 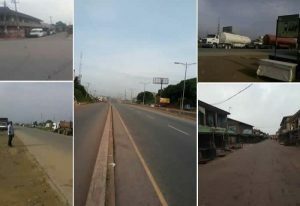 Main markets, businesses, parks and streets remained deserted on the 30th May, 2017 as residents in major cities in the southeastern parts of Nigeria stayed home in obedience to a call for a sit at home made by The Indigenous People Of Biafra, IPOB, and the Movement for the Sovereign State of Biafra, MASSOB, who had called for a sit-at-home in commemoration of the declaration of Biafra by late Chukwuemeka Ojukwu 50 years ago. In Owerri, Anambra, Enugu and Aba, markets including the popular Ariara main market in Aba were on total lockdown. The sit at home was to show respect for the people who died during the Nigerian Civil war. The civil war which lasted between 1967- 1970 remains one of Nigeria’s darkest moments in its history; a war which many continuously struggle to quantify its causalities, with some still referring to it as a genocide and asking that it be acknowledged as such. It was one that ended with the now popular slogan “No Victor, No Vanquished” gaining prominence. 50 years later, the actualization of the Republic of BIAFRA is moving from being a quest for terrestrial space, to being an Ideology growing stronger by the day, and in recent times being championed by Nnamdi Kanu. The name Nnamdi Kanu first started making headlines in 2008; initially he worked under the MASSOB umbrella, which he later left for the Independent Movement of Biafra (IPOB); he had called out for weapons to be brought out and used. This was also alongside several videos released where he called the country’s leaders as well as the nation in general several unprintable names. His many run-ins with the law led to him being locked up and held for a period of two years, after which he was eventually granted bail some weeks ago. 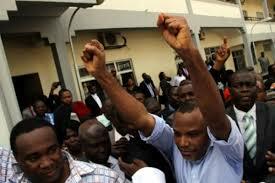 Kanu has been quoted as saying that he has no interest whatsoever in being president of Biafra should it happen. How true his claims are, remains to be seen, as his growing supporters refer to him as the supreme leader of the movement. Can Kanu be thought of as a leader? The answer to that question lies more in being able to answer the question; Does he have the ability to influence thoughts and opinions? 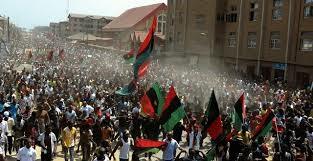 The sympathy of many Biafran agitators as well as some powerful elites who have been accused of being secret supporters is gradually on the rise, and is gradually becoming a source of alarm. Can Kanu be thought of as a leader? The answer to that question lies more in being able to answer the question; Does he have the ability to influence thoughts and opinions? The real dilemma faced by the Nigerian government itself in recent times especially with the recent directive of the sit at home instruction has to do with handling Kanu’s freedom, as twitter user @daeastener states: “Jail him he wins, release him he still wins”. It indeed remains a big challenge for the government and how this ends will be about how tactical it is with its approach. The sit at home Biafra situation and the continuous agitation for Biafra, is a call to wake up and smell the coffee, as well as put forward a different approach than the “Denial” that many continuously indulge in. Denial exhibited in the belief that people have no choice than to be a part of something that they feel has little benefit for them (project Nigeria). President Buhari was quoted as saying that the protests were being carried out by people “who were not even born during the war.” Do most people really still believe in Project Biafra? This writer isn’t exactly sure a lot of people do, BUT this remains the only outlet of venting pent up frustrations for many at the moment. The real issues seem to be the frustrations; social inequality, lack of basics which are very sparse in some geo-political zones than others. It’s a repetition of the same sorry tale when it comes to Boko Haram, the Niger Delta situation…. you name it. The afore-mentioned movements had the issue of socio-economic imbalance as the ROOT causes which the masterminds preyed on. The religious dynamics etc were only TRIGGER causes. The Civil war was decades ago, but continues to haunt us, because a new generation; most of whom had little or no idea of initial happenings and who have mostly relied on word of mouth accounts in view of new pent up frustrations are on the rise. Questions are being asked; about why things are the way they are in terms of infrastructural developments, political imbalance as well as development imbalance in many parts of the south eastern region. The government’s refusal to make the History subject compulsory in schools also speaks volumes in the attitudes adopted, with many echoing the question “what exactly is the government afraid of?” The danger of shying away from acknowledgements and discussions is leaving the door open for inaccurate accounts which can be manipulated by persons who have been tagged as miscreants by the government. Pro-Biafra movements have also accused Nigerian security forces of targeting and killing scores of their members, while security forces have fired back by saying that the activists have been stirring up trouble by attacking Fulani tribesmen, AFP reported. The blame games continue. Commuters stranded at motor parks as residents stayed home in obedience to a sit at home call. If there is any lesson that ought to have been learnt from the Civil war scenario of the 1960’s, it’s that Wars are expensive; in blood and resources, and ignoring this fact would be sad indeed. The vice president who has been holding fort for president Buhari surprised many Nigerians and got a lot of applause for attending the Biafra at 50 event held by the Yaradua Foundation and urged secessionists to abandon their calls for an independent state of Biafra and saying that the country was greater together than apart. This; many say is a step in the right direction; recognition, as against the norm of pretending that the civil war never happened, and a far outcry from the previous year’s reaction when during a similar celebration, lives were lost. However, beyond the lip service remains the demand of restitution by some and self-determination by others. Recently, the cries for self-determination have been strong on many frontiers; Palestine, Crimea, Biafra now amongst them has been on the rise with global bodies paying attention. The UN charter continues to be explored towards this end by many. Other points abound still, such as the nature of the Igbo race which is aptly caught by @tweetoracle “I know we the Igbo’s are marginalized in the Nigerian polity but Biafra is not the solution. Igbo’s have no KING let alone govern themselves”. The issue of marginalisation even amongst the Igbo community remains an issue. To this argument, however, some have raised the counter argument that the scenario painted will ensure that a perfect democracy can be fostered; of course, this could swing both ways, but can these differences be put aside for the purpose of self-actualization. This remains yet to be seen, but also more important is how the government handles the situation at hand, as stopping them from leaving Nigeria cannot be achieved by mere conversations that the Biafra ideology won’t work. Suffice to say that the country itself remains one daily confronted with the challenges of keeping diverse ethnic numbers together, while still managing a struggling Economy.